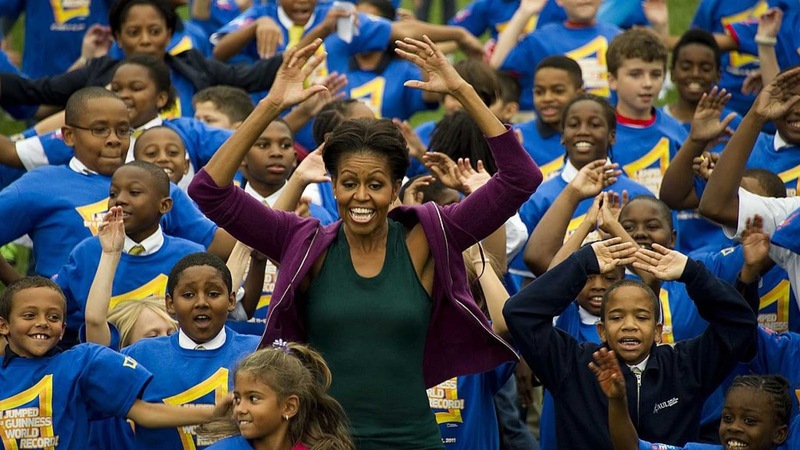 Michelle Obama once accidentally called herself a single mother. "Believe me, as a busy single mother — or, I shouldn't say single, as a busy mother," she said in an April 2013 TV interview. "Sometimes, you know, when you've got a husband who is president, it can feel a little single. But he's there." She went on to praise busy mothers — single or not — listing out the woes of "working, driving kids to practice, not having enough time to shop or cook, not having the energy, you know, the resources weren't the issue but time and energy is key." But the former first lady doesn't seem to be too keen on single fathers. She took a swipe at President Donald Trump — and single dads — during an event in London on Sunday. Hawking her new book "Becoming," she sat down with late-night talk show host Stephen Colbert at the O2 Arena, where she first bragged about how good things were when The Chosen One was in the White House. "For anyone who had any problems with Barack Obama, let’s just think about what we were troubled by — there were never any indictments," she said. Then she joked that America during Trump's presidency is like being a teenager from a broken home. "We come from a broken family, we are a little unsettled," Obama said. "Sometimes, you spend the weekend with divorced dad. That feels like fun but then you get sick. That is what America is going through. We are living with divorced dad." Interestingly, Barack Obama is the product of a broken family. His white mother and black father were married in 1961, six months before he was born, and split in 1964. His estranged father would visit him in Hawaii only once before he died in a car accident in 1982. His father's absence was part of the driving force behind Obama's memoir, "Dreams from My Father." He was also an advocate of fathers while president, even urging black men to stay in a family unit. "Fathers are our first teachers and coaches … they're our mentors, our role models," the president told a gathering of local students and their families in 2010. An official Father's Day Proclamation he issued that same year praised single fathers, saying "nurturing families come in many forms, and children may be raised by a father and mother, a single father, two fathers, a step-father, a grandfather, or caring guardian." Weirdly, no single mothers in those "nurturing families." Later in her appearance in London, Michelle Obama went on to say that living through Trump's presidency is like living through slavery or the Holocaust. "This may feel like a dark chapter but any story has its highs and lows but it continues. Yes, we are in a low but we have been lower. We have had tougher times, we have had more to fear. We have lived through slavery, the Holocaust and segregation," she said. "We have always come out at the other end — better and stronger. We are moving in a direction of diversity and inclusion. No one ever said it would be easy. We are just in the throes of the uneasy path of change."